← John Ehle. Move Over, Mountain. New York: William Morrow, 1957. Marybeth Whalen. 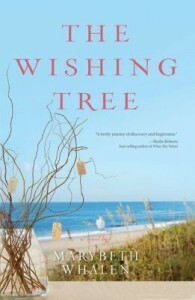 The Wishing Tree. Grand Rapids, MI: Zondervan, 2013. Just as the pieces of Ivy Marshall’s life are shattering, it seems like all of the elements in her sister Shea’s life are fitting together seamlessly. Shea’s long-term boyfriend Owen plans a grand, romantic proposal on national television. Meanwhile, Ivy discovers that she’s losing her job at the family company because her father is shutting down her local branch in Asheville. On top of that, she finds out that her husband Elliot has cheated on her. Ivy bears Shea’s good news through gritted teeth. To add insult to an already terrible situation, Ivy’s family and friends blithely tell her not to worry about her job termination and to see it as an opportunity to prepare for Shea’s upcoming wedding. For the time being, Ivy has decided to keep word of her marital discord under wraps. Since she and Elliot married under tense circumstances, she is ashamed to admit possible defeat to her family. Six years ago, Ivy was engaged to Owen’s cousin, Michael. Childhood friends Ivy and Michael and Shea and Owen coupled off naturally in their teens. Their lives were set on a happy track, but when Ivy met Elliot at a ski lodge on vacation, she recognized Elliot immediately as her true soul mate. She abandoned her family and her home in Sunset Beach and tossed away her former life to move to Asheville and wed Elliot instead. Lately though, Ivy observes that she and Elliot only seem to discuss “the business of life – what groceries they were out of, what bills needed to be paid, when they were expected to be somewhere” and she rues that their spark has mellowed. Elliot’s betrayal unhinges Ivy, but it is not a total surprise. The instant Ivy learns of Elliot’s infidelity, she sets out for Sunset Beach without waiting around for an explanation. The process of wedding planning is near traumatic for Ivy, especially since the news team that covered Shea and Owen’s engagement story is also interested in broadcasting their wedding. As all the decisions and preparations play out before Ivy’s eyes, she cannot help but consider the wedding she was supposed to, but never had. She fights back jealousy for Shea and what appears like a perfect wedding. Disillusioned by a broken engagement and a failing marriage, Ivy flings herself alternately between the men in her life, Michael and Elliot, confused about which path to take into the future – her past or her present. As she wonders what could have been with Michael, she plays a dangerous what-if game. But Elliot is not ready to let Ivy go and he uses creative measures to communicate his remorse. In a charming and modern twist on traditional love notes, Elliot creates a Twitter account and tweets his apologies and affections for Ivy through the handle, @ElliotIdiot. Forgiveness is a concept central to novelist Marybeth Whalen’s The Wishing Tree. One of Ivy’s greatest struggles is learning to accept being alone. While Ivy owes forgiveness to many people in light of her impulsive actions, she must also separate her individual desires and fears, and forgive herself, before she can find a happier ending.